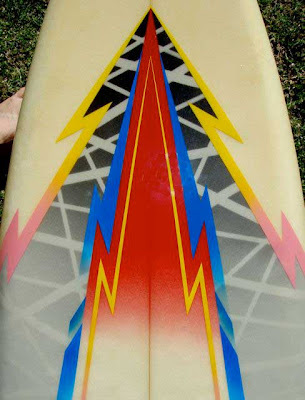 : Board Collector: Aussie Lightning Bolt twin fin. My passion, my fetish, my peccadillo, my obsession is Lightning Bolt twin fins. 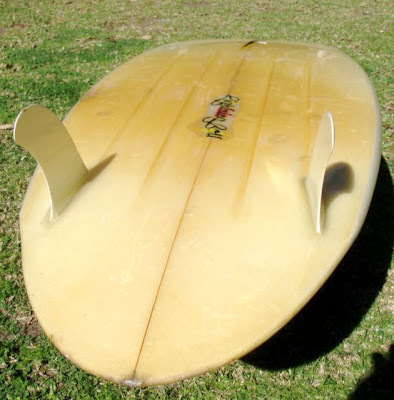 I found this 6'0" rounded pin tail, channel bottom, Australian made Lightning Bolt twin on the Gold Coast. It was shaped by Stuart Cadden at the Aloha factory in Brookvale and is right up my alley. The spray reminds me a a Eddie Van Halen guitar. This takes the collection of Bolt twinny's to four, 2 Aussie and 2 Yank. Nice painting ;]. That guy with the curly hair looks like Xander from Circle Jerks! Thanks for the photos and inspiration! 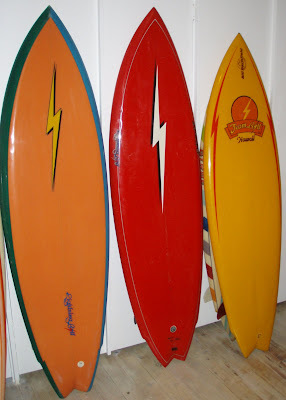 We recently relaunched the Lightning Bolt twin fins surfboards. The shapers for this new collection are Rory Russell, Graham Smith and Craig Hollingsworth. 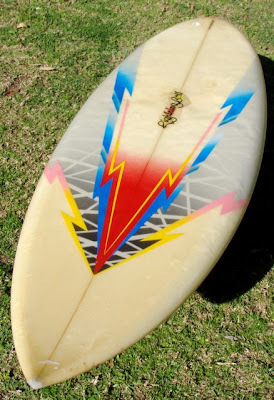 Cadden won the pro junior on that template,he surfed so sweet and fast.Is he still alive? He used to surf at Long Reef in Sydney. I used to hang out with Stuart when I lived on the Newport side of Bungan Head, best backhand tube rider of his day that I saw in Australia. Always had good boards under his feet and was a classic Aussie character. Humble bloke for someone so good. A lack of power in his surfing was his only weakness when the the power surfing became king or should I say "Kong". What he lacked in power being a smaller lean guy he made up for with speed and great technique. 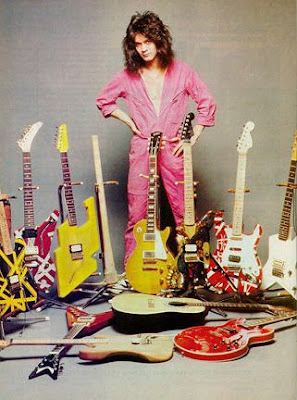 He would have been a pro for sure if he wanted to, but got into shaping instead during an era where money from sponsors was hard to come by.